Afterwards, Mickey Harte was adamant. "If we had played like that against anybody else tonight we'd have got two points," the Tyrone manager ventured. Instead, they were handed a five-point defeat by Dublin in the Saturday night Omagh rain. 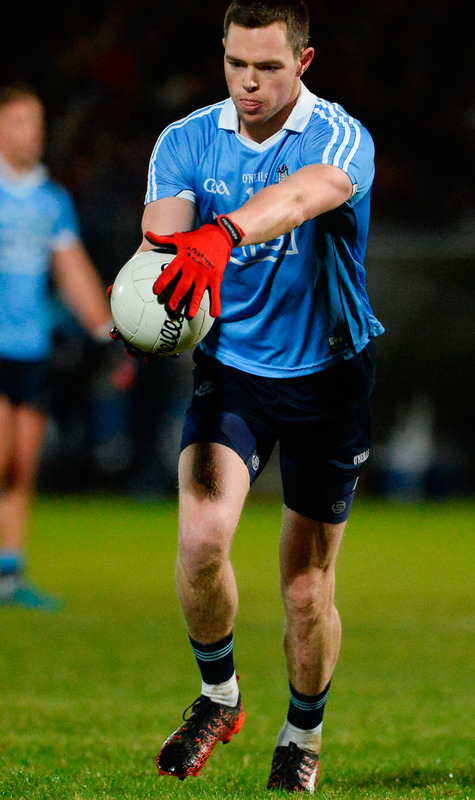 From Jim Gavin's perspective, he reflected happily on a second-half display where his team played from the 46th minute with just 14 men after Niall Scully was sent off for a second yellow card just as his manager was in the process of trying to substitute him. Despite this, Dublin kept Tyrone scoreless for the first 28 minutes of the half, scored 1-8 themselves after the break and went the entire period without kicking a wide. Considering the strength of the elements and the constricting force of Tyrone's defending, it was a remarkable demonstration of efficiency from the All-Ireland champions. One that as Harte observed, stood in stark contrast to his own team's efforts in front of goal, the most compelling factor in the result, he reckoned. "I don't think they turned the screw on us in the second half, I think we turned it on ourselves," said Harte. They kicked seven wides in the second half before Niall Sludden ended their frustration, included in which was a brilliant save from Stephen Cluxton on Lee Brennan, whose performance was Tyrone's consolation. It had started so well for the hosts as they went 1-1 to no score up after just six minutes, Cathal McShane slotting left-footed across Cluxton after Connor McAliskey put him through. And for all Tyrone's typically strong running, they looked most dangerous when they kicked early ball to McAliskey and Brennan, the Trillick forward who won an All-Ireland Under 21 title in 2015 but, to much local curiosity, has been mostly ignored by the seniors. Brennan's performance on the night, in which he kicked 0-6 (3f), suggested the locals had a point. "For a variety of reasons he's never been in a place to do it before," Harte outlined, "so it was big chance for him and he took his chance. "It's a credit to him because this was an important game against a big team and he didn't seem out of place." 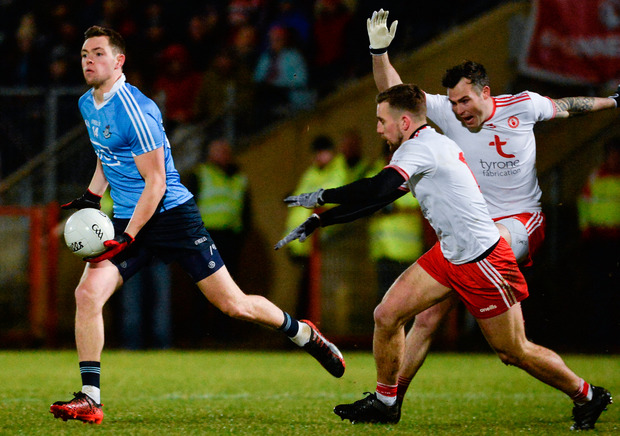 A Dublin challenge to Tyrone's early authority was natural. When the changes to their official team were revealed, Dublin's line-up contained 11 of those who had surgically dismantled Tyrone in Croke Park in last year's All-Ireland semi-final. One of them, Ciarán Kilkenny, got arguably the game's most important score. Notably, Kilkenny rotated between his customary deep-lying playmaking role and full-forward, the position from which he made his name as an underage forward of prodigious talent. After 23 minutes, a long Brian Fenton free found Kilkenny in this more advanced posting and the Castleknock man held off Aidan McCrory to volley left-footed past Niall Morgan for just his second senior goal for Dublin. At half-time they trailed by two but had the benefit of a swirling wind to come. Within five minutes, they led, even if Scully's sending off seemed to add a couple of degrees of difficulty to Dublin's task of seeing it through. "It was very debatable," Gavin reckoned. "It was probably a tick but to be down to 14 men, midway through the second half, to eke out the scores and finish the way they did…a real all round performance." They scored six points before Sludden got Tyrone's first of the half and another 1-2 directly afterwards, with Colm Basquel making a deep impression after coming on. Having scoring two of his final tally of three points in quick succession, he intercepted an intended return pass from Pádraig Hampsey to Niall Morgan from a Tyrone kick-out. From there he fed Eoghan O'Gara, who rammed home Dublin's second goal with his first touch. "We worked really hard to turn the ball over, Colm Basquel was through but he found the best man in the best position. That's what you want from the team," praised Gavin. "We're just back and in some ways, we're in our pre-season." Dublin have Donegal, Mayo and Kerry to come in their next three matches but with four points clocked and three more home games to come, already seem a smart bet for a place in the League final for the sixth year on the trot. Tyrone meanwhile, are stuck with nothing to show in the points column but Harte repeated his belief that self-destruction, rather than an overall inferiority, had caused their second loss in a week. "We were architects of our own outcome here," he stressed. "We should've got more out of that game because we created enough to get more out of that game. "I'm not concerned that we lost the game because we weren't competitive, we were competitive." SCORERS - Dublin: C Kilkenny 1-2, D Rock 0-4 (3f), C Basquel 0-3 (1f), E O'Gara 1-0, K McManamon 0-2, J McCarthy, B Fenton 0-1 each, Tyrone: L Brennan 0-6 (3f), C McShane 1-1, C McAliskey 0-2, N Sludden, P Harte 0-1. TYRONE: N Morgan 5; P Hampsey 7, C McCarron 6, HP MGeary 4; T McCann 5, A McCrory 5, C McLaughlin 5; D McClure 6, C McShane 7; M Donnelly 6, N Sludden 6, R Donnelly 7; C McAliskey 7, L Brennan 8, P Harte 7. Subs: M McKernan 6 for HP McGeary (22), R McNamee 6 for McCrory (h-t), C McCann 7 for McClure (49), R McNabb 6 for McLaughlin (55), F Burns 7 for R Donnelly (55), M Bradley 6 for T McCann (63).